The matter of retaining traditional Austrian regimental colours became a significant issue after the Austrian Anschluss as the formations of the Austrian Army were incorporated into the Wehrmacht. As the 'Hoch-und Deutschmeister' Regiment Nr 4 was incorporated into Infanterie Regiment 134, itself a part of the 44th Infanterie Division, they were therefore granted the unique distinction of carrying two different patterns of Colours. This occurred both before the war, such as when the troops were part of a parade in Berlin in 1938 and at certain special functions during the war such as in June 1943 when the 44th Infanterie Division was reformed following its destruction at Stalingrad and redesignated as the Reichsgrenadier Division 'Hoch-und Deutschmeister'. 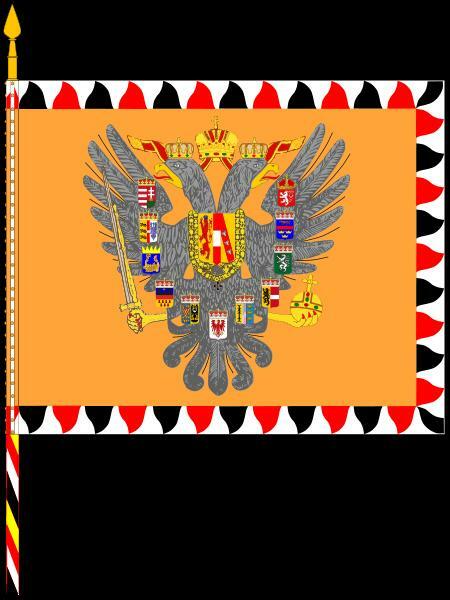 Centred on an orange field is the double-headed Imperial Austrian eagle, each head royally crowned. In his right talon the eagle wields the drawn sword of the Empire and a golden sceptre, while his left talon grasps the Imperial orb. The shield on the centre of the eagle's breast is divided in thirds to represent the Habsburgs, Austria, and Hungary. Around the wings and tail feathers are eleven crowned shields. Around the three free standing edges of the flag there was a 10cm-wide border. It consisted of 69 triangles alternating in colours of red, white and black. The fourth side was wrapped around and secured to the flag pole with four rows of 30 gilt nails each. Additional re-enforcement was provided by alternating red and white strips of a braided material under each row of nail heads between the heads and the cloth of the Colours. The flagstaff itself was adorned by spiralling stripes of yellow, red, white and black. The staff was capped by a plain spear head. 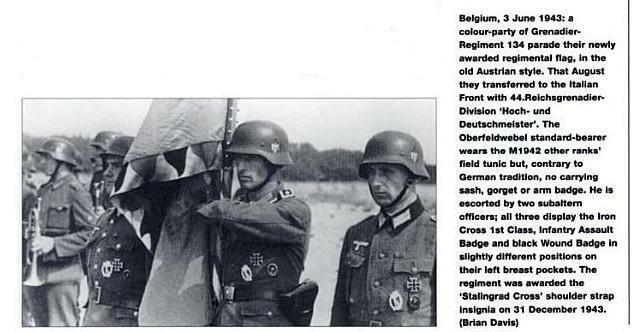 Unlike the Imperial Colours, the World War II era Colours were not adorned with battle streamers. The 'Deutschmeister Kreuz' takes its design from the crosses worn by the chevalier monks of the 'Deutschmeister-Orden'. The 'Deutschmeister-Orden'was part of the knightly orders that date back to at least the 11th Century. The official name given by the German Army to the device appears as the 'Deutschmeister Kreuz' as opposed to one commonly used by collectors that memorialises a massive defeat. The misnomer of 'Stalingrad Cross' arises from the name 'Stalingrad' which is displayed on a banner immediately below the national insignia. The 'Deutschmeister Kreuz' was authorised to be worn on the shoulder boards of any soldier or officer of the 'Hoch- und Deutschmeister' Regiment and the General Officers and Staff officers of the Division only. 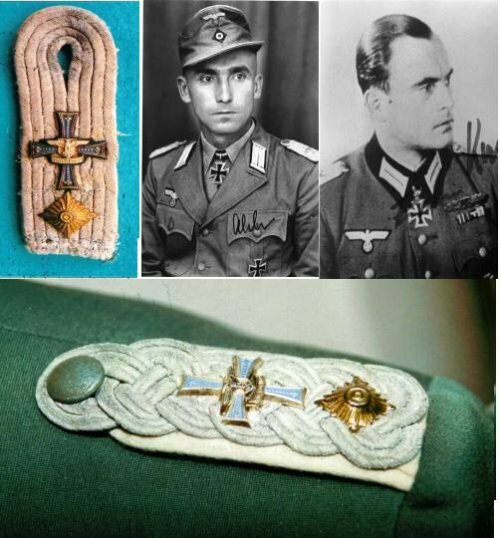 Interestingly enough, the Cross was such a popular item with the troops that they took to wearing them on their field caps on the left side, whilst this was against Army regulations it was in fact tolerated and a similar thing was done in many other elite Wehrmacht units. On 6th February 1945, OKH authorised the issue of a cuff title to the Reichsgrenadier Division 'Hoch- und Deutschmeister' in honour and recognition of "its heroic performance" in combat. However, due to the late issue of this order, it is unlikely that any such cuff titles were worn by the troops in the field and most experts on the topic agree on this. The post-war Divisional veterans association did however issue three variants of the cuff titles and these sometimes have been confused for ones awarded and worn during the war. 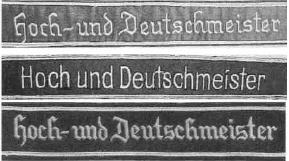 There are three known variants (as displayed above), that were designed, all bear the legend "Hoch- und Deutschmeister", all were machine embroidered in silver-grey yarn; one was in Latin script and the others in Gothic script. The top cuff title is in Gothic script and is on a dark green background and this variant was said to have possibly been designated for issue to the logistics element of the Division, the bottom cuff title is in Gothic script on a black background, this version was said to have been designated for issue to the 'Hoch- und Deutschmeister' Regiment alone. All remaining Divisional Regiments and Battalions were said to have been designated for issue with the middle example which was in Latin script on a black background.